We recently had a friend’s birthday breakfast, which is one of our favorite things to do. We all get together and bring different things and just talk for hours while our kids play. It’s all the best things in life–good food and good company! And now I’m gonna share the easy waffle recipe I made. I’ve never been much for making waffles, although I love to eat them. 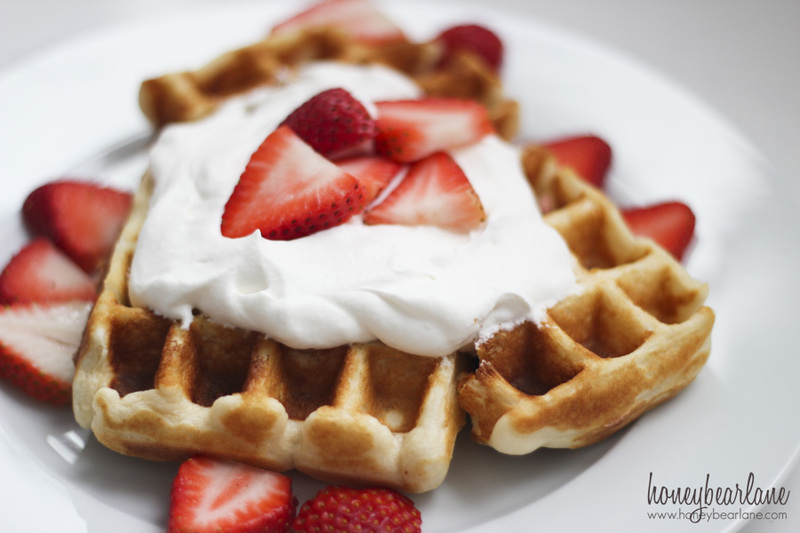 I adore the crispy, thick waffles covered in berries and cream or syrup or what-have-you. It’s an excellent vehicle for all kinds of sweetness. But like I said, I rarely make them. Probably because I have a terrible waffle maker and I didn’t have a good recipe. The recipe I had looked up once was kind of long and complicated, what with separating egg yolks and whites and all that. Too fancy for a breakfast food. So I found a good basic recipe on allrecipes.com and tweaked it to make it a little bit, um…better. Or maybe we’ll say a little bit more Heidi-ish, which is to say-with more sugar. Cuz’ I’m so sweet! Okay, just kidding, I don’t think anyone would say that. Also I added some cinnamon which doesn’t really make it cinnamon-ey but just adds something special. 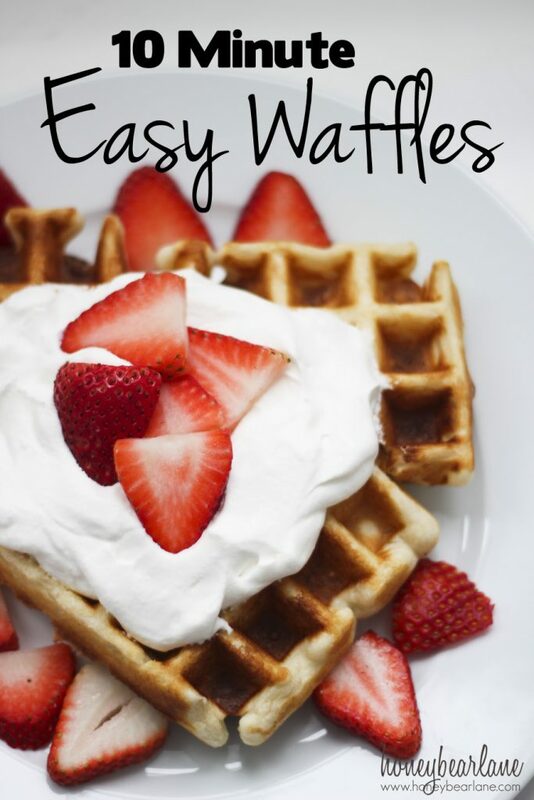 This recipe can be whipped up in your mixer or even your blender within less than 10 minutes and if you use a good quality waffle maker, you’ve got yourself some crispy and delicious waffles! This recipe is also doubled which fed about 5 adults and several bird-like-eating toddlers and I think it’s a better amount to make if you’re going to make waffles. You can always freeze the leftovers and toast them another morning, so just know–this is a big recipe! One more thing…it’s almost Valentine’s Day and these are the perfect breakfast for it. You can use a square waffle maker to make a heart shaped waffle. Just turn one of the squares into a diamond and cut another one on the diagonal to add to points to your diamond. It’s basic geometry, you can figure it out. Top it with cream and strawberries and it’s just lovely! We also ate it with this buttermilk syrup recipe which I will share soon because it is SO tasty! Break the eggs in a mixing bowl and beat until fluffy. Then add each ingredient, mixing well. Using a ½ measuring cup, dish batter into a pre heated, pre-greased waffle iron. Cook for allotted time (mine took four minutes using a KRUPS waffle iron). Serve with strawberries and cream or syrup and butter. I must try this recipe as it looks simple which is what we need with children and breakfasts! I have a tiny electric waffle maker but am contemplating buying a real old fashioned one for use on my job as they still sell lots of designs here in Portugal! Have you any words of wisdom as how to use one? Thanks! That should read on my HOB! Autocorrect strikes again!